Microsoft introduced Windows Update back in the days of Windows 98. This was a facility to get regular updates for Windows, both security updates, minor bug updates, driver updates and service packs. Since then the product has evolved. With Windows Vista and Windows 7 it’s integrated as a service into the operating system. 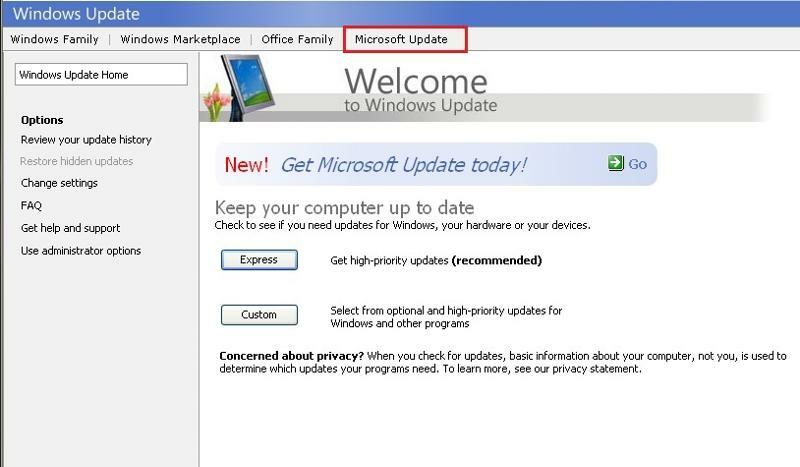 We can also use this update service to provide updates for all Microsoft products that are installed on the client where Windows Update is launched by updating this service to Microsoft Update. This process is slightly different depending on which version of Windows you have installed. With Windows XP we need to launch the regular Windows Update from the start menu by clicking Start > All Programs > Windows Update. Once the Internet browser opens with the Windows Update you will notice across the top of the screen an option for Microsoft Update, as shown below. 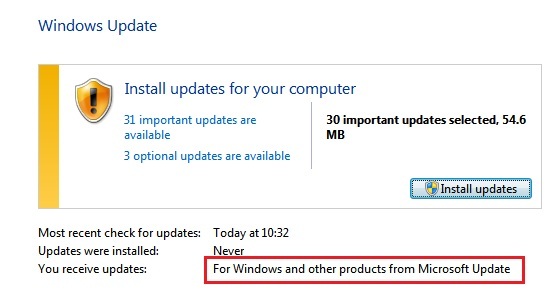 Click Microsoft Update and follow the wizard to install. Once done you will be able to scan updates for all available Microsoft Products installed on the client machine. With Windows Vista and Windows 7 the Windows Update tool is installed as a service and can be launched from Start > All Programs > Windows Update. This will launch the System and Security Centre and take you directly to the Windows Update section. The screen you will see provides information about how and what updates you are currently receiving. 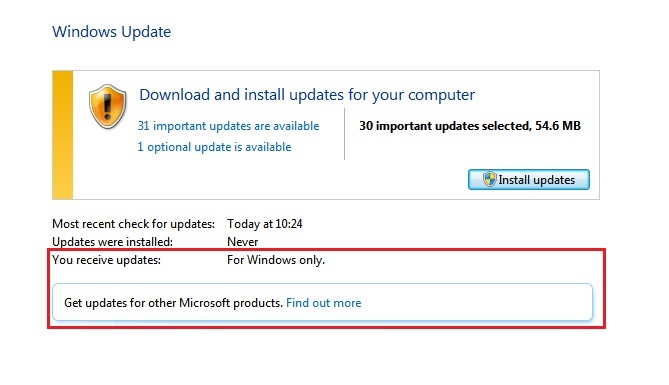 As shown below by default Windows Vista and Windows 7 will only receive Windows Updates. With Windows Vista and Windows 7 if the Windows Updates are controlled using WSUS (which if you are in a Small Business Server environment they will be by default). Unless you are logged on to the computer as an administrator you will not be able to control the Windows Updates and may see the screen below. If this is the case you will only be able to perform updates on this system either by approving updates via the WSUS console or by logging in as an administrator and clicking the Check online for updates from Microsoft Update option. This option will only appear if logged in with administrative privileges. Windows/Microsoft Update has evolved over the years; it has now become less prone to errors and with the release of Microsoft Update has actually proven to be quite a useful tool for keeping Windows & Microsoft products in general up to date. Using the built in tools downloads and installation of updates can be automated completely. With the central administration of updates using the free WSUS utilities we can ensure that even large networks are kept secure and up to date.